Immediately we see the clear outliers: plain functions, local functions, and Function variables. While I’ve talked about the slowness of these before, it’s good to see some confirmation. These are between 22 and 7 times as slow as the next slowest form of function call: calls through super. These in turn are 45% slower than statics and calls through an interface, which are 25% slower than everything else: methods, methods accessed through this, and overridden methods. If you want speed you should not be using plain functions, local functions, or Function variables. This should give some hint as to the speed of Flash’s package-level functions like getTimer(). Further, you can get big speedups by foregoing static functions, calls trough an interface, and calls through super, especially if you’re going to be using that convenience a lot. The rest of the functions are as fast as you can get. Don’t let anyone tell you that access specifiers matter, calling through this adds needless slowdown, functions should be final for speed, or overriding is handy but slow. It is handy, but it’s not slow. Keep the above speeds in the back of your mind as you architect and implement your AS3 programs. It may save you some optimization time down the line. Great effort on the tests but I can not agree on all your results. First of all the this modifier is added to every method. So your difference between methods including “this” and without “this” is based on your testing. They result in the exact same bytecode: every method is actually called like “this.method()”. Second: Overriding is not slow, if you do not call the super method of course. But in general, you do. Which also means you have the method call plus the super call from within the method. I’ve updated the article for the calls through this to drop them from the table and explicitly point out that there is no statistical relevance to using this when making the function call. Previously I simply didn’t discuss it, but this way is better. Thanks for pointing it out. As for interfaces, I did the test and updated the article with this. Surprisingly, calling through an interface variable is significantly more expensive than calling directly or through a class variable. Thanks for pointing this out! PS: I also added getters and setters, but there’s no statistical difference there either. So the statics are much faster… on the surface. The advantage to the instance getter is that it allows you to de-static the rest of the work that will be done by the function. For example, if the doMethod() wants to call doOtherStuff(), that would also be a static function call since doMethod() has no this to call through. This is not the case with the instance getter approach. So I think the usual order where classes of utility methods (eg. a MathUtils) are built of all static methods rather than an instance getter or plain functions in a package and a singleton as a class with a static instance variable and getter is right for performance as well. Very good point. This is exactly the kind of advantage you get going the “instance getter” way that you can’t take advantage of the “static” way. Thanks for the sample code showing this. Heya Jackson. Thanks for these tests! I’m quite shocked by the performance of plain functions. 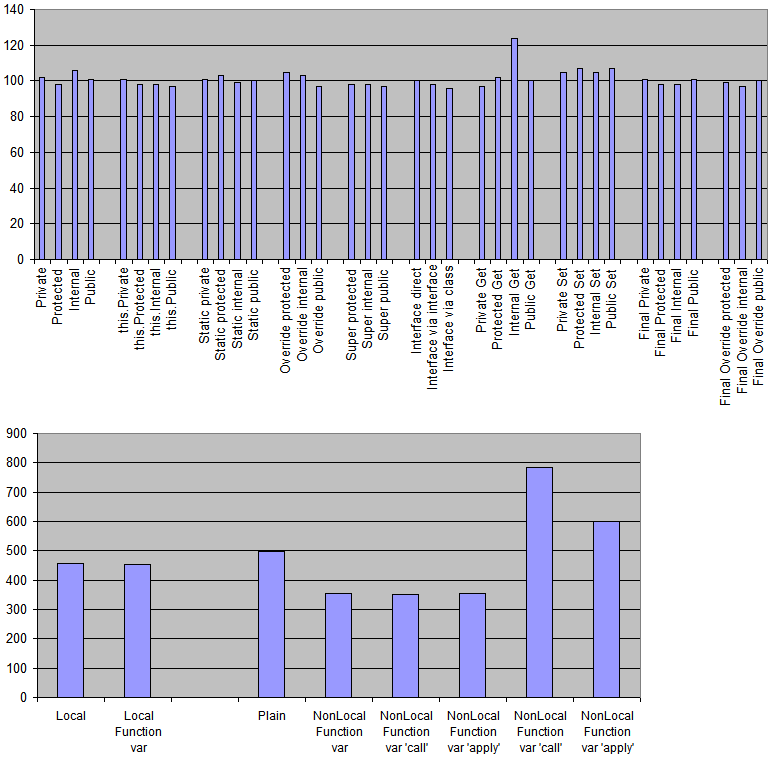 Package functions are a litte more than double as fast – better said half as slow ;-) Still.. I totally haven’t expected that. As for the other tests (static, internal, private, interface etc.) I have seen a *much* slower difference in my testing. Could it be that you’ve tested with the Debug Player? Debug Player often gives pretty different results..
Nope, I always test with the release player. Could you post your times with the release player as well as system and OS specs? You test in the Releaseplayer? In your code you use ‘trace’ to test the performance. When I actually test it I use a TextField to log, but the usage of that TextField is not timed. I switch it to trace for the posting to make the test clearer to readers. Perhaps in the future I’ll leave in the logging to a TextField. Thanks for posting these! I’m surprised that static calls and super method calls are so fast on your environment. Maybe it’s a difference in Flash between Windows and Mac. I’ll try it on my Mac and post updated numbers. Thanks again for this. Thanks for the link. The article is quite good! It is no surprise that calling an interface method is slower when using the interface type instead of the direct class. But finally some evidence! The same applies to Java by the way as well. Did you check the speed of final functions? Apparently the should be faster, because they cannot be overriden. Good point! I’ve updated the article with functions defined with the final keyword. It didn’t make any speed difference, so I noted that in the article. I also added TextField-based logging and spread the tests out over frames since it was getting to the point where I was getting 15 second timeouts. Thanks for the tip! What about anonymous functions? Though we could expect this to be mostly the same as a Function variable, you never know. There are tests of local functions and function variables already. Did you mean something different? If so, could you provide a brief bit of code showing what? Thanks. Hmm, thanks for this great article! BTW I’m wondering what about AS2 ? You’re very welcome! If you port the test to AS2, I’d be happy to post it. 2. A registers an event listener and B dispatches an event. The event however is a custom event since I need to pass some parameters as well. The closure would be the fastest, however, if you go that route you may as well make an interface for it, which is around 10x faster; But the event method is the one that actually holds to the B not knowing of A, at least as far as your own code goes: FP code knows A exists. A function call via an interface would be the simplest, fastest, and equally extensible route to go. Skyboy is correct. #1 will get you “local” speed from the table above. #2 will be terrible in performance, as shown by TurboSignals. Skyboy’s recommendation, which I agree with given your constraints, will get you “interface via interface” speed from the table above. The gap has closed in Flash Player 10.1 though, so check out the update article. Thanks. I hadn’t thought of using an interface, but it seems to fit my purposes excellently. I copy/pasted the code exactly. yeah, it seems I was running IE9 with the debug player. of note, with the debug player installed on IE9 it won’t run the release version of the code. where with Chrome, the debug or the release version of the code, is the same and fast. It seems IE9 running Flash Debug Player is exhaustively slow. And runs everything the same. That would help a lot. I forget when I’m running the debug player. I can conclude its best to use Final Internal or this.Protected as the fastest ways to architect code? There will naturally be some “wiggle” in your test results. Try running the test several times and seeing how the results vary. I think the differences between access specifier (public, private, etc.) and final/not final are minor testing anomalies: they don’t actually change the performance. For the sake of interest and with all the fuss these days about Flash on iOS, I decided to execute this script on an iPhone 4. I had to make a couple modifications. 1) The NUM_ITERATIONS was made into a private static const. 2) NUM_ITERATIONS was DECREASED by an order of magnitude. Execution times were still abysmal. Built for iOS from Flash Builder 4.5.1 targeting AIR 2.7. Interestingly this flies completely in the face of the optimization ‘wisdom’ preached by Adobe themselves. And no, those last results aren’t typos, I had to wait several minutes before I saw any results. 1) Make sure you’re using a release build. ActionScript typically runs 2-3x slower in debug builds. 2) A static field lookup every loop will be very expensive and greatly increase loop times overall. It’s annoying to have to keep declaring NUM_ITERATIONS locally, but local variable lookup is really worth it. Sorry about that. You’re absolutely right. Also the discrepancy in my first test for Final functions was because NUM_ITERATIONS still existed as a local field. Please (if possible) delete or severely edit my first post. Here are updated, more accurate numbers. I humbly and profusely apologize for the horrible misinformation prior. It is still disappointing, however the performance drop is not nearly as jarring as before! I performed these tests three times. Once I saw an anomalous doubling of this.Private, but that did not occur 2/3 times. However Protected Set is consistently twice as slow as its Internal, Private and Public counterparts. As for your test results, they’re pretty much the same as my results except for the getters and setters. Keep in mind that the iPhone 4 is running a single-core 800 Mhz ARM chip and my test machine in the article was a 3.0 Ghz Intel Core 2 Duo. The iPhone’s also got an 800 Mhz memory bus compared to the 1066 Mhz dual-channel memory bus on the desktop test machine. Given such a huge hardware advantage on the side of the test machine from the article, I don’t think it’s so unreasonable to expect an order of magnitude less performance out of the iPhone. Still, you’re seeing a ~50x slowdown, so there’s a good chance that more is going on here. Perhaps the compiler used to compile the Flash Player VM is not as optimized for ARM as it is for x86. For example, Flash Player may be compiled with Intel’s highly-optimized compiler when targeting x86 and the much-slower GCC may be used when targeting ARM. Together, these hardware and software differences alone may be responsible for the difference. Thanks for the performance numbers! How about accessing functions via the index operator? There are a couple test cases missing for this: a reference function var (not local, and shouldn’t be included in the dynamic function tests to avoid the overhead; plain should be moved out) and apply/call. Includes some 10.3 results (which you missed doing an update on). Should get a really good representative sample of performance across platforms and CPUs (some really high end machines, low end machines like mine, various windows versions, linux. maybe some macs).